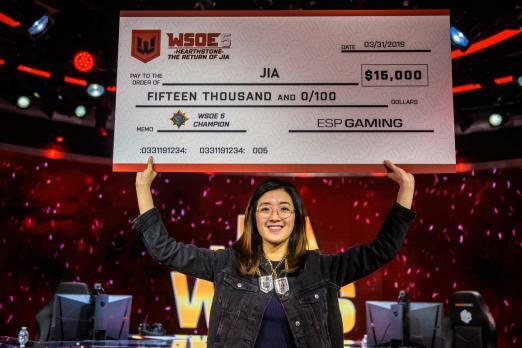 Jia Aquino "Jia" Dee successfully defended her title at the WSOE 5: Hearthstone - The Return of Jia. The win gives Jia $15,000 and a new record of being a two-time Hearthstone Champion. The tournament started with matches between the world’s top Hearthstone players. The first match featured Cora "SongBird" Georgiou taking on Alexandra "Alliestrasza" Macpherson and the second included Pathra Cadness going against Slysssa. Pathra took the series 3-0 on a Priest deck, while SongBird had a 3-1 success with a Rogue deck. In the next round, Pathra was unable to get a win against SongBird, forcing her to the Loser’s Finals where she faced Slysssa yet again and won. The Grand Finals finally saw Pathra successfully win against SongBird 3-2. In the first game of the championship match, Jia went with her Paladin against Pathra’s Priest deck. Pathra won game one with Jia herself saying later she used the wrong deck. Jia expected Pathra to go for her Rogue deck early. The second game featured Jia using her Priest deck to tie the series 1-1. This lead to Pathra finally using her Rogue deck, and, unsurprisingly, won game three. The fourth game saw Jia choosing to go for her Druid deck against Pathra’s Rogue deck. It looked as if Pathra could take the win and the championship early on, but a series of bad draws allowed Jia to claim the win. The series went down to a tense game five, with Pathra using a Warlock deck. The game saw Jia’s token Druid appear to be too much for Pathra to handle. Pathra was able to defend herself against Jia and later in the game cast Corpsetaker. However, it wasn’t able to get taunt, leaving Jia free to attack Pathra’s hero. When asked about her win, Jia jokingly said that “Treespeaker is the best.” During the WSOE 2, Jia revealed the prize money was to be used for her braces. This time around she says she has no specific plans, but it would be “hopefully something that can help me in my esports career.” She is also looking into streaming, citing that may people have been telling her to stream. The next WSOE tournament is scheduled in April 13 and 14 and features Dota 2.